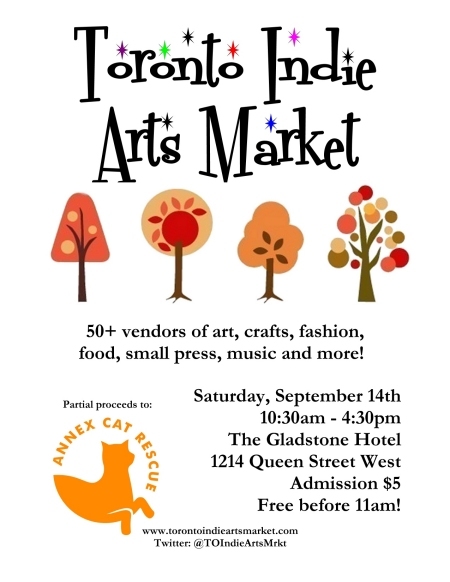 So by now, most regular readers/followers know that I’ve spent the past few months putting together a series of mixed media markets, the first of which takes place this Saturday, September 14th, at the Gladstone Hotel. We did a trial run back in the Spring and we’re hoping that we can create a regular place for small-scale artisans, in a variety of mediums, to sell their work to the public. We’ll have over 50 great vendors selling everything from fine art to comics, clothing to housewares, so please come out and show your support for local artisans. As an added incentive, admission is free before 11am, and the first 100 paying customers will receive a 2-for-1 pass for our October market. So please come out and join us. It’s supposed to be a lovely day – cool but sunny – perfect for a stroll along Queen Street West. Hope to see you there.